NB: If you find any error please follow this New link >> Download links of for Cambridge IELTS 1-12 With PDF, Audio, And Answers (Updated and checked on 14th October 2018). Cambridge Practice Tests for IELTS contains four complete practice tests for the Academic module of the International English Language Testing System examination, plus extra Reading and Writing papers for the General Training module. The inclusion of annotated keys and tape-scripts for each test makes the book ideal for the purposes of self-study students. The cassettes contain listening material carefully chosen to reflect the reality of the exam in terms of timing, format and the types of speaker and accent used. 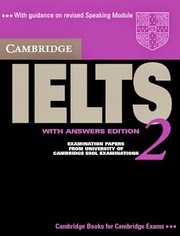 Cambridge Practice Tests for IELTS 1 contains four complete practice tests for the Academic module of the International English Language Testing System examination, plus extra Reading and Writing papers for the General Training module. This collection of practice material for the International English Language Testing System (IELTS) has been specially prepared for publication by the University of Cambridge Local Examinations Syndicate. It provides students with an excellent opportunity to familiarize themselves with IELTS and to practise examination techniques using Authentic Test Material. Cambridge Practice Tests For IELTS 3 provides students with an excellent opportunity to familiarize themselves with IELTS and to practice examination techniques using authentic test material. This collection contains four complete tests for Academic candidates, including practice in the updated Speaking Test (June 2001 syllabus), plus extra Reading and Writing modules for General Training candidates. Cambridge Practice Tests For IELTS 4 provides students with an excellent opportunity to familiarize themselves with IELTS and to practise examination techniques using authentic test material from Cambridge ESOL. This collection contains four complete tests for Academic candidates, plus extra Reading and Writing modules for General Training candidates. Cambridge Practice Tests For IELTS 5 provides students with an excellent opportunity to familiarize themselves with IELTS and to practise examination techniques using authentic test material prepared by Cambridge ESOL. Each collection contains 4 complete tests for Academic candidates, plus extra Reading and Writing modules for General Training candidates. Cambridge Practice Tests For IELTS 6 provides students with an excellent opportunity to familiarize themselves with IELTS and to practice examination techniques using authentic test material prepared by Cambridge ESOL. Each collection contains four complete tests for Academic candidates, plus extra Reading and Writing modules for General Training candidates. 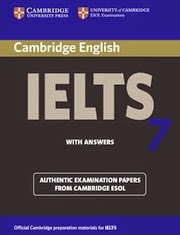 Cambridge Practice Tests For IELTS 7 provides students with an excellent opportunity to familiarize themselves with IELTS and to practice examination techniques using authentic test material prepared by Cambridge ESOL. Each collection contains four complete tests for Academic candidates, plus extra Reading and Writing modules for General Training candidates. 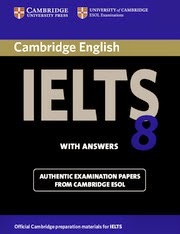 Cambridge Practice Tests For IELTS 8 provides students with an excellent opportunity to familiarize themselves with IELTS and to practice examination techniques using Authentic Test Material prepared by Cambridge ESOL. Each collection contains four complete tests for Academic candidates, plus extra Reading and Writing modules for General Training candidates.